Armenian leadership’s attempts to demonstrate the Armenia-Azerbaijan Nagorno-Karabakh conflict as a conflict over the protection of human rights and assert that Azerbaijan demands territories without the Armenian population are completely unfounded and nonsense, deputy head of the foreign relations department of the Azerbaijani Presidential Administration Hikmet Hajiyev told Trend on Oct. 12. He also said that Armenia’s talks on human rights when it grossly violates the most fundamental rights of more than a million Azerbaijani internally displaced people and refugees, and goes beyond all political, legal and moral frameworks. “Armenia’s such claims are nothing more than hiding the aggressive policy, creating an untrue impression of the real affairs and attempts to divert international community’s attention from the fact of Armenia’s aggression against Azerbaijan and the military occupation of the Azerbaijani territories, which is the basis of the conflict,” he said. 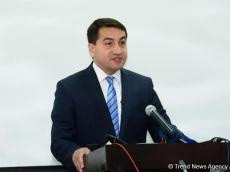 "Armenia must understand that military aggression and the situation, accompanied by bloody ethnic cleansing and gross violation of human rights, will never be considered legitimate,” Hajiyev said. “Therefore, the international community unanimously accepts and supports the territorial integrity and sovereignty of Azerbaijan within internationally recognized borders,” he said. “Armenia’s claims on the creation of a democratic and civil society, without stopping an aggressive policy and fulfilling international legal obligations, are nothing more than words." “As opposed to the mono-ethnic Armenian state, Azerbaijan is a multicultural country with an inclusive society,” Hajiyev said.